The auction checkout process is a thorn in the side of many Auction Chairs. 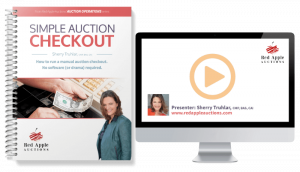 I’ve got a 90-minute Simple Auction Checkout training webinar that explains the step-by-step process, including the roles and responsibilities of the people on that team. Today’s post introduces you to one team member, whom I’ll argue is the most important. Benefit auctions are run by volunteers. So when the big day arrives and you’re unlocking the doors to greet swarming guests, which volunteer is CRITICALLY important onsite? It’s not the décor chair. It’s not the gal overseeing the catering. It’s not even the Auction Co-Chairs, though I have built my business around their existence. 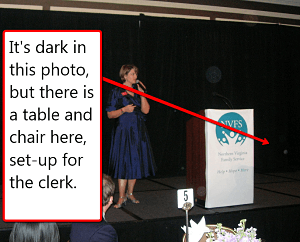 When it comes to your onsite team, the most important benefit auction volunteer is … the clerk. Auction clerks go by different names. You might refer to your clerk as a recorder, secretary, or tracker. In essence, the clerk the person responsible for writing down the sale price and bidder number, in that order. When I sell the first item and say, “Sold for $700 to bidder #146,” the clerk is writing down “$700, #146” on the first item ticket (ticket = a piece of paper). If the auction is running fairly typical of most galas, another volunteer is taking that piece of paper from the clerk and physically walking it over to the auction checkout team for processing. The primary change we made to the event this past time was in the auction checkout process. The auction chair and I spent well over an hour one night talking through a simple, manual process that would work without computers or credit card machines. Part of our training included a discussion about the role of the clerk. At the event itself, I made a point of introducing the clerk, whom I will call Kelli. Kelli was seated to the right of me, facing the crowd. Everyone laughed. And no one bothered Kelli. Working in peace, Kelli tracked the numbers accurately, despite our having to make some spontaneous changes during the live auction. For the first time in six years, this event had a systematic check-out. The Auction Chair was rightfully proud. At the end of the night, she had a spreadsheet that listed sale prices, item numbers, and bidder numbers. “Look at this!” she said, grinning ear-to-ear and waving a spreadsheet for me to see. When it comes to the clerking role, here are some tips. The clerk should sit up next to the auctioneer, facing the crowd. She should never be seated at a table in the midst of the guests where she can be easily distracted by guests. The clerk should have self-confidence. If your clerk misses a sale or bid number, she needs to have the confidence — and a strong enough voice — to LOUDLY interrupt the auctioneer and ask for the sale or bid number. These numbers are critical data! Many auctioneers – myself included –promptly forget the numbers once verbalized. It’s easy to correct a missed number if the correction is made immediately. It’s harder to find the winning bidders once we are two or three items further along. Good clerks are detail oriented. For instance, at one of my auctions, the CFO of the nonprofit is the clerk. As a CFO, he is detail-oriented and clerking is a fitting role. Clerks should understand how their assignment fits into the larger checkout process. Usually the clerk is a member of the check-out committee / team. Clerks should be focused and not easily distracted. Clerking is no time for socializing! In this sense, an outsider whom no one knows could be a good fit for the job. A clerk is one person, not two people. There is no need for job-sharing when it comes to clerking; it’s a solo performance. My experience has been that co-clerks make more errors than a single clerk. Instead of taking personal responsibility for tracking numbers, they rely on each other to get a number. UGH! This is not what you want. In short, if you screw up the clerking, your event is screwed. You have inaccurate data … you don’t know who bought what, for what… and you’ve just lost important historical data points that would have helped to plan next year’s benefit auction. Do you see why clerking is such an important role? It’s uber-important to wisely select a clerk. And don’t forget! If you’re not so confident in your auction checkout process, my DVD training – Simple Auction Checkout: How to run a manual auction checkout. No software (or drama) required!” – teaches you how to set-up, staff, and run an auction checkout flawlessly. Grab your own DVD and watch it again and again to nail down this process, prior to your next auction.